The finest dark oak wood flooring, wool and linen carpets, fully fitted bathrooms boasting the best in European fittings and furnished with designer Italian furniture, fully complement this historical location right in the heart of 'The City', London's financial and business district. Fashioned from the shell of a former period office building and comprising 14 beautifully designed contemporary and airy London London short stay, the upper floors enjoy unsurpassed views of the city skyline. That skyline includes the 'Monument' from which the area takes it's name which was built to commemorate the Great Fire of London, a major three day blaze that swept through the central parts of London in 1666. A striking penthouse featuring two spacious outdoor terraces top off this unique development. 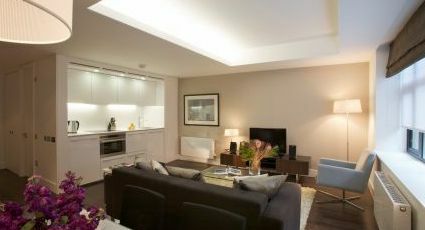 Monument station is conveniently located a few minutes walk away and is serviced by the Circle and District lines. Alternatively Bank station is a slightly longer walk away (7 mins) providing Central, Northern and Waterloo & City line services as well as District Light Railway.